If we fail to take care of the natural systems that keep us alive, what else matters? The economy? Health? Security? Life itself is on the line. We see it here [at COP21] focusing on climate, but curiously, the ocean is basically not on the balance sheet among the deliberations that we are here to witness. That must change. We have to look at the whole Earth, including the dominant feature—the ocean—that drives climate and weather and is home for most of life on Earth. Despite the fact that the ocean covers 71 percent of Earth’s surface and has absorbed nearly half of all human-produced carbon dioxide (CO2) since the Industrial Revolution, the ocean was not officially included on the agenda for the COP21 summit. Paradoxically, climate researchers warn that the ocean’s ability to serve as such a massive carbon sink may soon hit a tipping point once it becomes saturated and thus unable to keep CO2 from rapidly accumulating in the atmosphere, throwing global warming into overdrive and causing seawater to acidify. Leading coral reef scientists including Professor Ove Hoegh-Guldberg, director of the Global Change Institute at the University of Queensland, predict that climate change may cause reefs to cease to function as ecological cradles for marine life by the year 2050 if our CO2 emissions aren’t halted. Marine wildlife ranging from plankton to whales are, as Dr. Earle says, “like trees, carbon-based units that capture and sequester carbon, ultimately in long-term storage within deep-sea sediments.” Commercial fishing clear-cuts ocean food webs, removing millions of tons of this “blue carbon” from the ecosystem. Through her foundation, Mission Blue, Dr. Earle is calling for the establishment of a global network of marine protected areas in part to safeguard these stores of blue carbon from harmful extractive practices like commercial fishing and deep-sea oil and gas mining. Marine protected areas, which Dr. Earle calls “Hope Spots,” prove effective in allowing ecosystems to recover and gain resilience in the face of threats like climate change. For the first time, the capture of carbon in soil (or “carbon farming”) is being considered as part of the global response to the climate crisis. It’s time for blue carbon farming to be put on the table as well. The Australian government agrees, having just announced the creation of the International Partnership for Blue Carbon, which will unite governments, non-profit organizations, intergovernmental agencies and researchers to study and protect coastal blue carbon ecosystems. 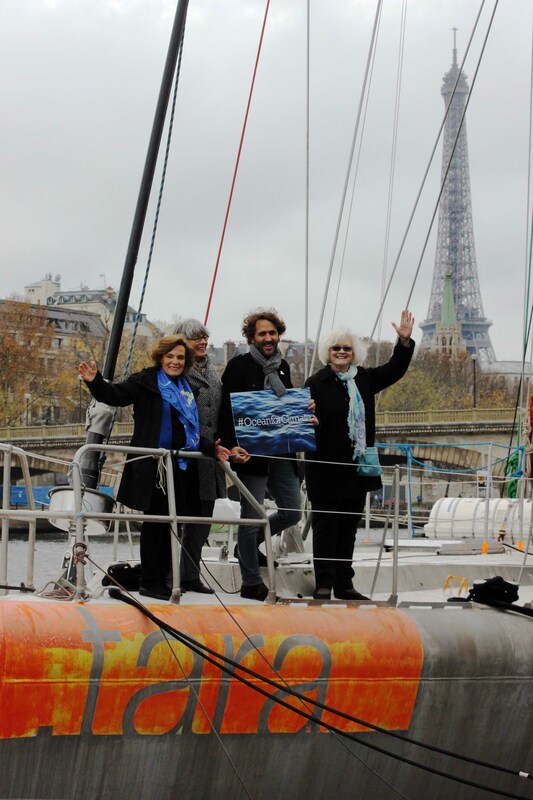 Dr. Sylvia Earle joined the Ocean and Climate Platform aboard the Tara Expédition vessel. Image courtesy Jon Slayer. Despite its absence from the official agenda, Dr. Earle has helped give the ocean a voice at COP21. She spoke of the importance of ensuring a future with coral reefs in conversation with Sir David Attenborough, Sir Richard Branson, Director General of WWF Marco Lambertini and XL Catlin Seaview Survey Head of Science Professor Ove Hoegh-Guldberg. She served as ambassador for the Ocean and Climate Platform, a movement launched by Tara Expéditions’ Romain Troublé that is likewise seeking to inject ocean issues into climate negotiations. And on Monday, Dr. Earle presented alongside world-renowned primatologist and conservationist, Dr. Jane Goodall, for Earth to Paris—Le Hub, an event hosted by the UN Foundation at Le Petit Palais featuring dialogues between experts, advocates, and CEOs about innovative solutions to climate change. The two legendary female scientists discussed efforts to mitigate the effects of climate change both on land, as part of Dr. Goodall’s Roots & Shoots program, and at sea, as part of Dr. Earle’s Hope Spots initiative. Visually uniting these two projects, The Jane Goodall Institute and Mission Blue launched Tapestry of Hope—an interactive map created by Esri that weaves together the work of hundreds of thousands people who are inspired by Dr. Goodall and Dr. Earle’s message of hope to take action and create positive change for their communities and our world. Even if the COP21 outcome agreement entirely overlooks the ocean’s role in solutions to the climate crisis, the health of the ocean is in our hands. As Dr. Earle says, “Our fate and the ocean’s are one. Quite simply, no ocean, no life. No blue, no green. If not for the ocean, there would be no climate to discuss or anyone around to debate the issues.” Every individual has the power to speak up for our blue planet—to become a pinpoint on the Tapestry of Hope.